The Railway Track Diagram series of books provide a reference for industry and enthusiast alike. They detail the railway infrastructure as it exists today showing all tracks, junctions, tunnels, signal boxes level crossings sidings and depots, complete with their railway mileages. 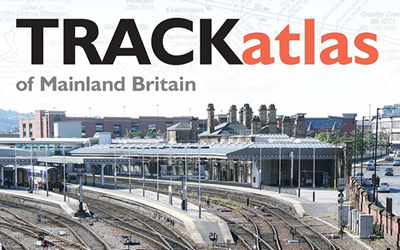 The TRACKatlas shows the extent of national network at track level and is designed to set out the railway infrastructure in a geographic context. Bespoke mapping provided to the Rail Industry. Maps are geo-schematic or line diagram and can be structured to cover the whole network or a specific area. Maps can also be provided from any other source of data and supplied in paper, laminated paper or magnetic whiteboard format. 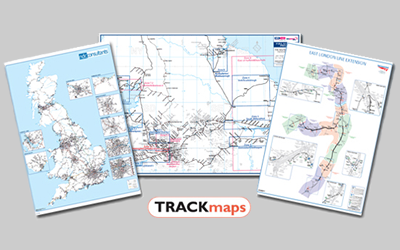 Trackmaps is a publisher of books and maps designed to inform Rail Industry professionals and railway enthusiasts on current UK infrastructure in detail. Best known as the publisher of the popular and well-respected Quail Track Diagram series of books which provide detailed information concerning the rail infrastructure of Britain, Trackmaps also provides the editorial content for the TRACKatlas published by Platform 5 Publishing and for the bespoke rail mapping provided to industry by ESR Cartography Ltd.
Our shop is designed to make it easy for you to buy our printed products. To find out more about each product, go to Products and make a selection. Select Details & Buy for any product to find the description, contents and access to sample pages so you can assess which product is best for you. You can purchase as a Guest, with the choice of registering later or, if you have previously registered, login to your account. No sale takes place until you reach the checkout and you can view the contents of your shopping basket at any time. For a secure transaction, we use a third-party off-site card processor, in this case SagePay and your order and card details are encrypted as soon as you send them so credit card details are never seen, held or retained by us. We are PCI-DSS compliant and our systems are verified by Securitymetrics. If we say the item is in stock, then in stock it is and ready to despatch. If it is out of stock, we’ll give you a guide as to when it is available but if it is out of print, you need to monitor our site to see when it may be available. 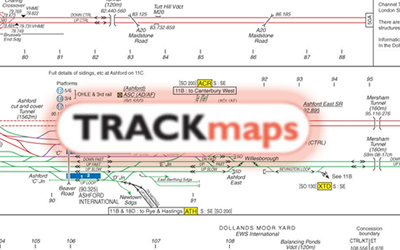 The best method of ordering Trackmaps products is through this site but we are still happy to take orders by telephone. You can call us with your order but be warned that the sales line is not staffed every hour or every day. We also accept orders by post. For more details, see the How to Order Page and to contact us, find our details on the Contact page.